Somewhere in the peaceful town of Treeville, high among the pine trees and maples, someone is stirring up trouble. Mrs. Hummingbird returns home from lunch to find that her nest has been disturbed! The sparrows haven’t seen anyone, nor has Mrs. Wren. When Mrs. Woodpecker from Apple Valley suspects a culprit, the police begin their search. Who is this villain and what has she done to upset an entire community? 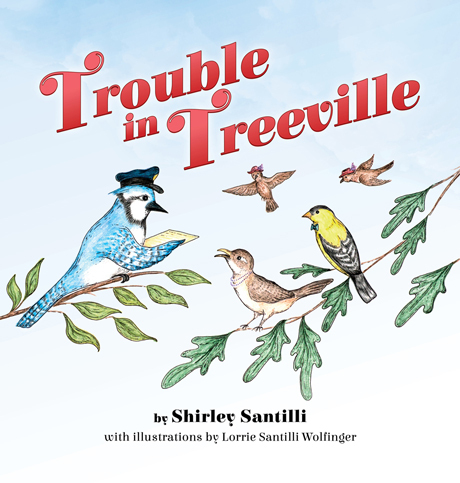 Trouble in Treeville is a delightful and educational read for children, parents, and teachers alike. Shirley Santilli was born in Mohrsville, Pennsylvania in 1934. She currently lives in Shoemakersville, where she has resided for fifty-eight years. She worked as a telephone operator and in the local school library and was on the school board for twenty years. She was also the secretary for her husband, John in his business, San-Tool. Shirley and John are the proud heads of a family of three daughters, six grandchildren, and four great-grandchildren. Her family inspired many of the stories she’s written. All of her children and grandchildren have fond memories of listening to her storytelling when they were young. She wrote Trouble in Treeville in the 1960s, but it wasn’t until 2011 that she decided to finally pursue publication. With her daughter, Lorrie, as illustrator, Shirley’s longtime dream of becoming a published author finally became a reality! Lorrie Santilli Wolfinger was born in Reading, Pennsylvania in 1956. She currently resides in Shoemakersville in the home next to her parents’ home where she grew up. Lorrie and her husband, Thomas, have three children and four grandchildren. Currently she is an elementary physical education teacher, but she has also worked in a bookstore and as an acrobatics instructor at several dance studios. Her artwork has been admired as set designs for annual dance reviews and Nutcracker performances. Lorrie has always loved children’s books and playing with children. Illustrating Trouble in Treeville and working with her mother is one of her proudest accomplishments. It is a dream come true!